Nearing Diwali means receiving greetings (and sending too!). This year by email I continue to receive greetings aplenty and I feel I would not be able to reply personally to everyone. Not that I am lazy or do not have feelings of reciprocity; I will be on a week’s tour and when I return another festival would be in the offing! So through this Blog I convey my hearty greetings to all valuable readers who have already sent and all those who plan to send. Some greetings are just from special websites that promote free exchange of greeting cards while a few that reached me had their own stamp of the maker. Definitely the makers have exceptional artistic ability whose limit to innovation was their own imagination only. 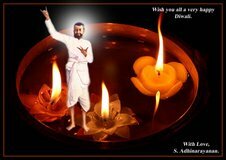 I am proud to present here six greetings from Dr Adhi Narayanan, a devotee and who has keen interest in photoshop and from another devotee Bharat Churiwala from Mumbai who is one of the moderators of the Holy Trio Group. May the blessings of the Holy Trio be on them is my earnest prayer! Saadar Pranaams on this auspicious occassion of Deepawali. Some time I am really wonderstruck at COMPASSION in Swamijis and Matajis of Ramakrishna Order…..
Really the pictures by Bharatji and Adhiji are breathtakingly beautiful !!! What more better it can be than getting the greetings with Mother on the cover !!!! Pranams at Maharaj’s holy feet. The following is an extract from the Vedanta Kesari that aptly describes Maharaj. It is thus no doubt then, that Maharaj has an abundance of messages! We are so blessed to sit at Maharaj’s feet and on the joyous festival of Diwali we are thankful to Master and Holy Mother that the light in the form of Maharaj is with us. Apni amar sashtang pronam ebong subho Deepavalir subhecha o antarik sradha neben. My sardhaar and haardik pranaams at your lotus feet. Diwali ki shub kamanaaye aur naye varsh ka abhinandan. It is trully a blessing to have the opportunities to sit at Swamiji’s feet and receive the divine wisdom. how lucky can we be. HAPPY DIWALI to all, around the world. Thanks for the bright light you brought to our Blog. Your blogs are gr8 help to educate and bring awareness. Seek your blessings on the occasion of Deepavali. Shuvo Bijoyer pronam and Dewali greetings to you. It is very nice of you to keep in touch through your blog regularly. Although it is not possible to comment always but certainly it is very interesting and admiring to read all your good works home and abroad. Happy Diwali! All the best greetings to everyone at the Ashram. Pass my regards to revered Swami Saradanandaji Maharaj. 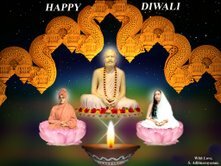 Rishal passes his regards to Revered Maharaj and best wishes for a Happy Diwali. May this Diwali grant your good work with a life full of bliss and nectar. Thank you for taking the trouble to nurture both Nini (my wife) and I into a spiritual ascent. I am a bit late, since I was on journey to return in Europe from India. So please accept my belated pronaam. The greetings you have sent are so wonderful. 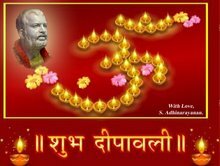 Belated Deewali greetings to you. In Kolkata Kali puja went off very well. Doordarshan showed live telecast of Dakshineswar kali puja. 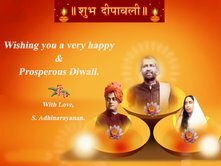 The Diwali Greetings sent by you are really heart-touching. Please accept my belated greetings. Yes, Divakar, we all should pray for the innocent victims. If only we could reach Swamiji’s message everywhere! You might remember what he told on 11th september, 1893 at the Parliament of Religions in Chicago: Sectarianism, bigotry, and its horrible descendant, fanaticism, have long possessed this beautiful earth. They have filled the earth with violence, drenched it often and often with human blood, destroyed civilisation and sent whole nations to despair. Had it not been for these horrible demons, human society would be far more advanced than it is now. How true it is even now! Thanks for the Depavali Greetings. Very nice. The slide show is also good. Looking forward for latest slide shows. Once again my pranam. Once again, thanks for posting such creative, luminous, and bright greetings! By glancing at these wonderfully lit up pictures, an extraordinary wave of peace somehow fills the mind! A big thanku to Bharatji and Adhiji for their wonderful innovations.